Some of the hijackers were trained by the US government, at Pensacola Naval Air Station. An interesting claim, and perhaps one at odds with the frequent description of the hijackers (or at least some of them) as “flight school dropouts”. Were they trained properly, or not? "But something that everybody wants to ignore is that three of the hijackers, at least, were trained at Pensacola Naval Air Station not at a local airfield - on the base, by the government, at least"
However, if you look at the original source for this story, a Newsweek article, you'll find some important qualifications. "there are slight discrepancies between the military training records and the official FBI list of suspected hijackers—either in the spellings of their names or with their birthdates. One military source said it is possible that the hijackers may have stolen the identities of the foreign nationals who studied at the U.S. installations". "What we have here is a situation of people with identical names", said Harry White, public affairs officer at the base. He said the school has had more than 1,600 people with the first name Saeed, spelled various ways, and more than 200 with the surname Alghamdi. White maintains, however, that none of the Saeed Alghamdi students was involved with terrorist activity. "We have found no direct connection between any of the foreign students trained at NAS Pensacola and any of the terrorist suspects,? he said. The three foreign nationals training in Pensacola appear to be Saeed Alghamdi and Ahmad Alnami, who were among the four men who allegedly commandeered United Airlines Flight 93. That flight crashed into rural Pennsylvania. The third man who may have trained in Pensacola, Ahmed Alghamdi, allegedly helped highjack United Airlines Flight 75, which hit the south tower of the World Trade Center. One oddity for these three is that none of them are suggested as being pilots, in the official 9/11 account. Why would the plotters bother training Jarrah for Flight 93, say, when he would be accompanied by two more experienced, military-trained pilots on 9/11? And the dates pose a problem, too. The article talks about Saeed Alghamdi registering a car in March 1997, for instance, but according to the hijackers I-94 document, that would make him surprisingly young. If the birth date is accurate, and the accused hijacker is the same one who trained at Pensacola, then he was registering a car and learning to fly at the age of 17. If he was in the same group for the 1996 date they mention, maybe 16. 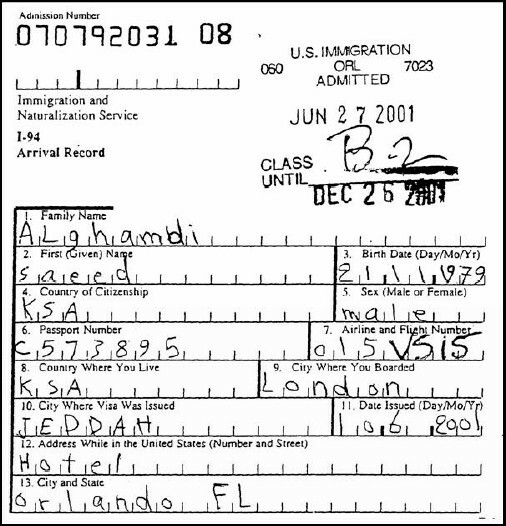 Meanwhile Ahmed Alnami has a claimed birth date of December 1979 (http://www.factbites.com/topics/Ahmed-Alnami), so is likely to have been 18 at the time the first Pensacola driving licenses were issued. Would Pensacola really accept pilots of that age, who perhaps hadn’t even completed their schooling? ...records show Hamza Alghamdi, Alnami and Saeed Alghamdi lived at the complex off and on since 1992. Daniel Hopsicker made an early comment on the general story, too. “Probably not talking about the same people” does not quite strike the right note of decisive certitude that we would expect when discussing the identities of the people who have just been responsible for the deaths of 6,000 more or less vaporized Americans. Not certain enough? But then it hardly indicates a coverup, either, or you might just expect the statement to say “it wasn’t them”. Hopsicker pressed on, though. We reached a major in the Air Force’s Public Affairs Office who was familiar with the question, she said, because she had read the initial Air Force denial to the media. “Some” of the ages? We told her we were only interested in Atta. Was she saying that the age of the Mohamed Atta who attended the Air Force’s International Officer’s School at Maxwell Air Force Base was different from the terrorist Atta’s age as reported? We asked if the registrar of the International Officer’s School might provide us with the name and address of this second Mohamed Atta, so that we might call him and confirm that there were really two Mohamed Atta’s of about the same age pursuing flight training in the U.S. at about the same time. So according to Hopsicker, this Atta may have been the same age as the hijacker, in which case maybe they were the same guy. In which case it’s definitely suspicious. Or is it? Perhaps not, if we go back to the original Newsweek article. "It is not unusual for foreign nationals to train at U.S. military facilities. A former Navy pilot told NEWSWEEK that during his years on the base, “we always, always, always trained other countries’ pilots. When I was there two decades ago, it was Iranians. The shah was in power. Whoever the country du jour is, that’s whose pilots we train".